A few years ago, Cheryl Muñoz and other moms in Oak Park, Illinois regularly patronized the Oak Park Farmers’ Market during the summer months. But when winter came to this Chicago neighborhood, they missed having regular access to local foods. So Muñoz and these other women decided to form a food co-op that would supply local foods year-round. Muñoz had a relative in Traverse City, Michigan, home of Oryana Natural Foods Market, a year-round food co-op. This Midwestern food co-op proved to be just the inspiration that was needed. “Why not do this in Oak Park?” Muñoz thought. “Us moms started talking about it,” she says. 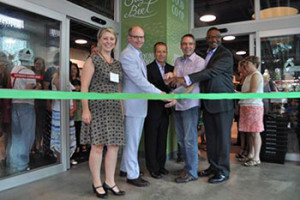 Born from this initial desire of Oak Park moms wanting access to local food, three years later their vision came to fruition with the grand opening (mid-August 2015) of the Sugar Beet Food Co-op. Modeled after the Dill Pickle Food Co-op in Chicago’s Logan Square neighborhood, the Sugar Beet Food Co-op is larger than its older counterpart. Both are part of the Chicagoland Food Co-op Coalition. The result of Oak Park moms pooling their efforts and another co-op sharing its expertise is a new co-op that offers a plethora of products and is thriving with many members. Indeed, the Sugar Beet Food Co-op features a wide variety of products, ranging from beer to diapers, from other 300 local farmers and producers. More than 1,300 households are members of the co-op. But the co-op is more than a place to buy food and hang out—it’s built around education. Muñoz is also executive director of Sugar Beet Schoolhouse, a nonprofit organization tied to Sugar Beet Food Co-op that strives to educate Oak Park residents about the importance of local food and agriculture. Since its inception in 2012, its educational offerings have impacted more than 4,500 people. “It’s important to educate the community about what healthy food is,” Muñoz says. Additionally, through a partnership with the Park District of Oak Park, Sugar Beet Schoolhouse provides children the opportunity to grow food, which is distributed as food aid. To date, more than 500 pounds of fresh, locally-grown food has been donated to a local food pantry. To help the Sugar Beet Food Co-op launch as a startup, 72 people loaned the co-op $880,000 on very generous terms. But despite the co-op’s broad support and its many member households, its business plan is still quite conservative. A Pete’s Fresh Market branch is slated to hold the grand opening for its Oak Park store on September 2, and this store will compete with the Sugar Beet Food Co-op. But Muñoz knows the Sugar Beet Food Co-op has something that chain groceries don’t—a sense of community. As far as Muñoz’s future vision for the co-op, “We’re taking it one month at a time right now,” she says.